In first two mission the whole British Task Force 57 will be outside of Okinawa area and it has a purpose to suppress Japanese airbases on Sakishima islands and disrupt plane transfers from Formosa too. In total there will be 350 various planes possible to transfer from Formosa and Sakishima to air withdraw. 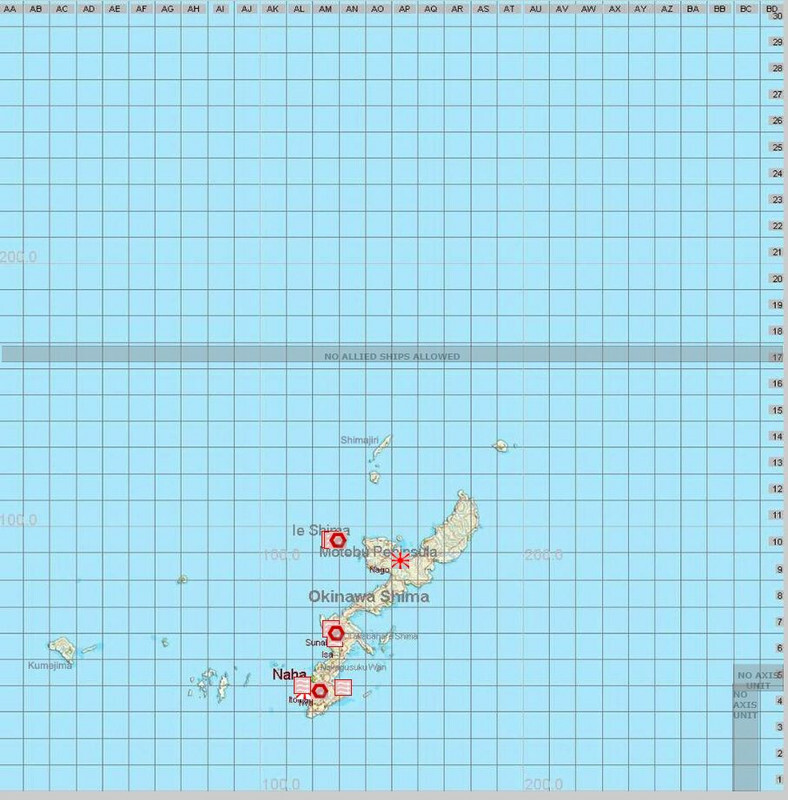 All the planes that are able to get to it will become available for Japanese use on SW corner of Okinawa map. It is an imperative for Allies to destroy as many planes on the ground/air as they can. Allies also need to cover their own fleet. 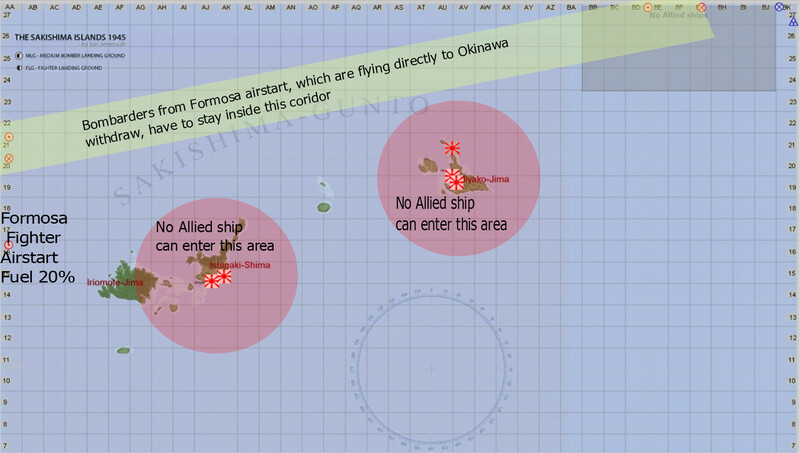 Any plane/ship lost on the Sakishima map can not be replaced on the Okinawa map and it is counted in total losses. 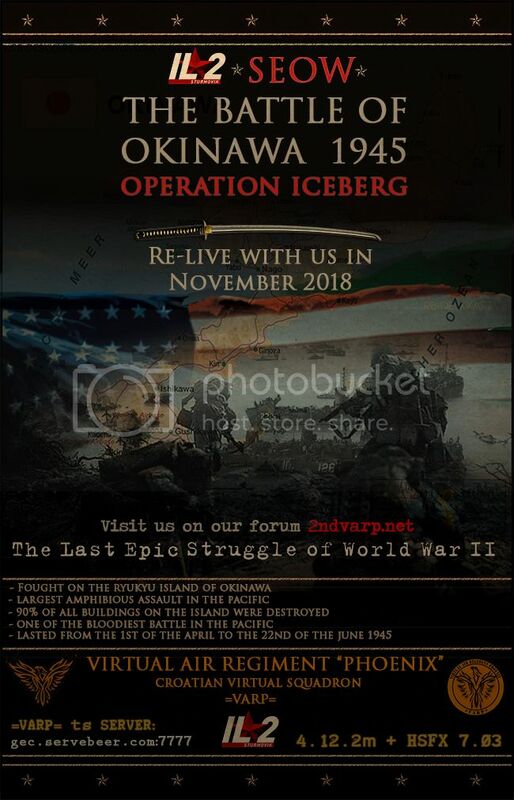 British Task Force 57 can return to Okinawa map as early as mission 5, but it doesn't have to if commander decide he don't need it. No Allied ship should come 30km from any of Sakishima islands. All the action need to be air to air or air to ground. Axis side is allowed to perform anti ship actions if they want. In meanwhile, while we fly Sakishima map, AI stuff will be doing their part on Okinawa map. Allied side will be allowed to sail around Okinawa island and to shell it from 3 battle ships task group. On the mission planner map it is drown how close to shore this battle ships can come. This will simulate huge bombardment of the island prior the landing. Coming that close to shore will be allowed only in those 2 AI missions. Allied big bombers should flat the place, and both sides need to gain recon where the enemy is because initial recon is set to 0 on both sides. In this two AI missions, Allied commander need to put landing ships force in a position from which landing will be executed in mission #3. 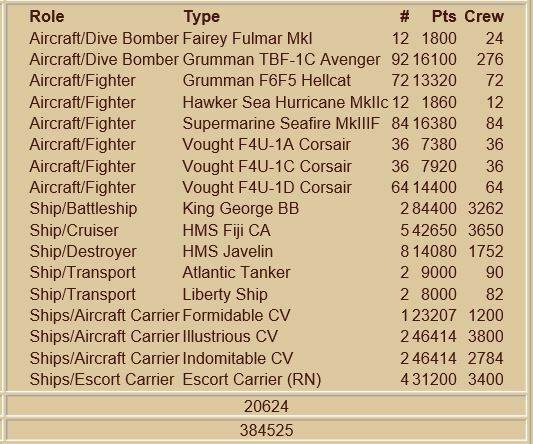 Even if Axis gain recon on the American fleet earlier, they are not allowed to attack it prior mission 3 when all the small boats are unloaded and ready to sail to shore. When it comes to Yamato battle group, they can move around northern part of the map in every mission, but are allowed to go south outside exclusion zone only after mission 5. US recon planes should find the battle group and keep an eye on it. Allied side is not allowed to attack Yamato battle group before mission #5.After that they can attack it regardless if the battle group went out exclusion zone or not. BTW, exclusion zones are area marked on the mission planner map where you are unable to send ships because it refuse to finish plot. In this 2 AI missions both sides can plan fighter cap and escorts, plus Allied side can send bombers to lit up Okinawa island. 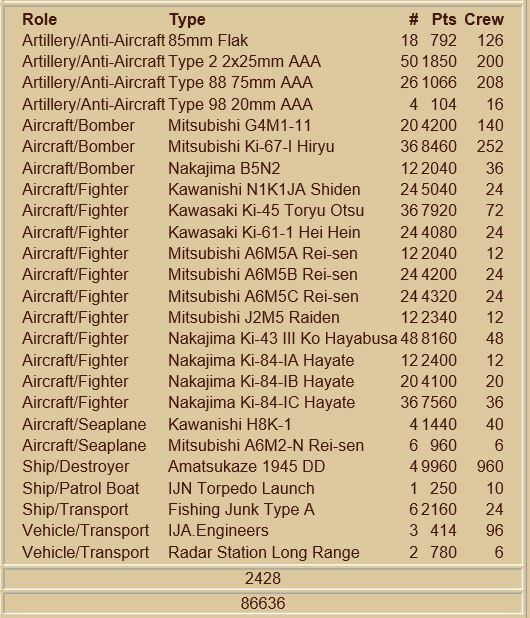 Since commanders need to plan flight for Sakishima, those 2 AI missions on Okinawa will have only 30 plane slots for Allies, and 20 for Axis. ALL of them should be marked as AI ONLY. Use them wisely. Why i chose DUKW and LVT instead of normal landing crafts? It is because there is quite a lot of this transports and collisions are almost unavoidable. Well, the only problem is that even if your small transport hit the BB or CV, both are gone. This is game limitation. So using land version of the object prevented any crashes between them or between them and capital ships. For all capital ships commander should take really good care not to crash them. What is lost is lost, and no commander error will be repaired. One of the factor for victory are the ship, so please pay attention to it. The only thing which might be repaired is if ship hit damaged ship in front of it which slowed down because of the damagae. There is no collision avoidence for the ships in this game. The best solution to avoid collision are task forces with enough separation. I have placed all the ships in task forces as a defaul state. It would be the best that commander make timing so landing crafts hit the beach at the end of the mission. This is because there will be less chance that transports get destroyed by artillery peaces you missed in "softening" process. Make sure that landing fleet is covered from the air to the last second of the mission. After mission #3 is over, units packed inside crafts need to be unloaded and after that we are in sort of normal war we had many times before. Both sides have a steel runaway added in the middle of the sea inside of exclusion zones. Ships can not be ploted there but planes could go in. However, since this area simulate off map location, play fair and don't camp there waiting for enemy planes on landing to shoot them down. You are allowed to go in, make recon etc.,but sustain yourself from going there attacking planes on landing. Both places are marked with baloon. On this link you will find a document which will show you what are the points collecting options for a victory. Click here to view the original image of 1019x577px. Fighters from Formosa have only 20% of fuel. They should be used by AI and all of them should be planned to land and in the next mission sent to Okinawa air withdraw or used by humans. Axis human pilots should use available planes from those 2 islands. In first 2 missions Axis will be available to plan 150 to 200 aircrafts (still need to test tech ability). This is all there it is all together Allies have 988 planes in TF58 and another 408 in British TF57. 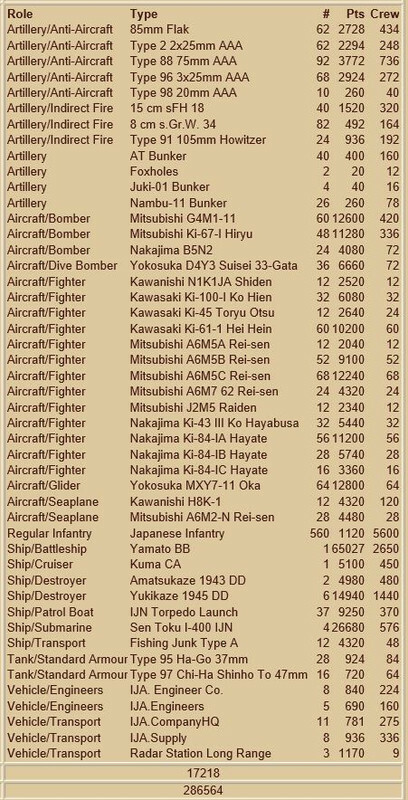 Japanese have 688 planes/suicide bombs plus 24x Ki84IC, 24x N1K1JA in ressuly available after 4 mission. They can transfer another 350 planes from Formosa/Sakishima. Minimum changes to number of units/type are possible when i start to test technics/ships. Very interested by this campaign. the I/JG2 Richthofen http://www.1jg2.net/Accueil/Presentation.aspx Will soon take contact with you. We can also arange frendly match between our squads?We are one of oldest squads in il2,finalist of USL 2010- 2011... and we all fly closed pit! Nice idea ! i will contact you by MP.  MP sent on your Forum ! Hi,can you please you and your team apply on side and give a ansver to =VARP=Thor? It is urgent!!! Mods will be released in 3 or 4 days! Start is delayed until 11.11.2018! So you have time to apply! Mods are released on our website! Hello ! Do you have some news about the fixes after the (3 FPS) during Stress test ? The Mod works correctly, we have noticed no bugs with it. 1. Auto start 21:00 without any waiting or restarting. 2. 1.5 hour missions...we could have 2 per night if we want or just 1 if it is too painfull to plan. 3. Since i don't plan to redesign the speeds or unit positions, we will need ~24-28 missions with shrinked time. 5. Rules and goals stay the same. 8. Number of sea/ground moves stay the same. Crues should stay the same and we just switch sides.